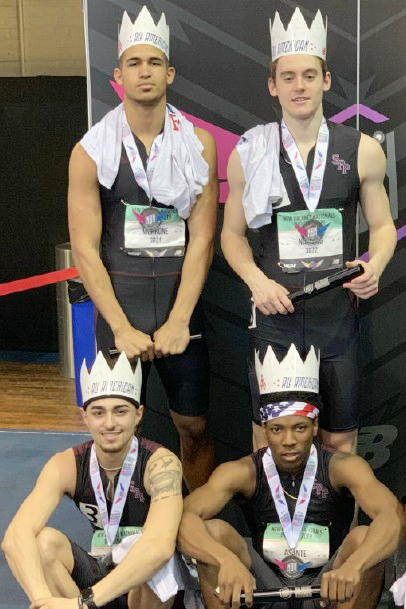 The St. Peter’s Prep 4x200-meter relay team finished sixth in the nation and earned All-American status. Bottom row, from left, are Richie Luzzi-Liggins and Ayir Asante. Back row, from left, are Joey Morrone and Gus Nations IV. Putting a track and field relay team is sometimes like finishing the perfect 1,000-piece jigsaw puzzle or creating a prize sculpture from a block of clay. You need a little bit of luck, a lot of strategy and the textbook amount of chemistry and camaraderie. St. Peter’s Prep head track and field coach Chris Caulfield knows all about constructing a fine relay team, in his case, the 4×200-meter relay team that recent had an indoor track season for the ages. Before the indoor track season began, Caulfield wondered about how he was going to create a 4×200-meter relay team for the Marauders. So there were the mainstays on the relay, guys like senior Richie Luzzi-Liggins, who had already established himself as one of the top sprinters in New Jersey on the heels of finishing fifth in the 100-meter dash last spring at the NJSIAA Meet of Champions, and senior Gus Nations IV, who was on the relay team last year and had been a four-year staple of the Marauder track squad. But the other two spots were totally wide open. One thing was for sure. Junior Joey Morrone wanted one of those spots. Morrone, a football player like Luzzi-Liggins, eventually worked his way onto the top relay squad. The last piece of the puzzle was yet another grid star. Ayir Asante, a two-time Hudson Reporter All-Area wide receiver for the Marauders and a former Hudson Reporter Athlete of the Week, never competed in track and field before. Asante, already committed to play football at Holy Cross this fall, pondered the idea of finally running track. There was never a question of Asante’s speed. Anyone who has seen Asante catch a pass and go, it’s like he was propelled out of a cannon. He’s clearly the fastest player to ever wear pads on the gridiron for the Marauders – and that alone says a lot, because the team has had its share of speed burners. But Asante had no peers. He took a screen pass in the NJSIAA Non-Public Group 4 state playoffs against St. Joseph’s of Metuchen last fall and was simply gone – and everyone stopped and watched in utter amazement. So there you had it, the making of a perfect relay team. Now all it needed was practice. And more practice. A relay team is simply not running fast. There’s the passing of the baton from one to the next, which needs utter precision. But the remainder of the team knew Asante was the key ingredient. Nations IV, the other mainstay, has always received jokes about his name. Some even thought he could collect the nickname of United, as in United Nations. Ah, get it, he could have been the Ambassador of United Nations. Nations was coming off a complex injury to his hip that required him to miss all of last season. So that was another obstacle. But after it was constructed, the Marauder relay team took to the track with a vengeance. They didn’t have a lot of chances to compete together in meets, but they were poised to make noise at the New Balance United States Nationals at the 168th Street Armory in New York. The Marauders qualified for the nationals and eventually placed sixth overall, making them All-Americans. “United” Nations had his goal. For Luzzi-Liggins, it was the second time he was on an All-American relay, as he was part of the relay team in the outdoor track season two years ago that earned the distinction. “When it became real, it was pretty unreal for me,” Asante said.